‘Nature, Creativity, Adventure’. Combining creativity with outdoor skills and a love and knowledge of nature is what we believe makes Miscellaneous Adventures unique as a brand and design studio. So when Rachel from The Dulwich Picture Gallery approached us last year to ask if we would teach a creative workshop for their ‘Love your Landscape’ family festival, we jumped at the chance to get involved. The theme for this year’s festival is inspired by the gallery’s current major exhibition, Harald Sohlberg: Painting Norway. Sohlberg’s work perfectly evokes the wildness of Norway, using bold shapes and colours. 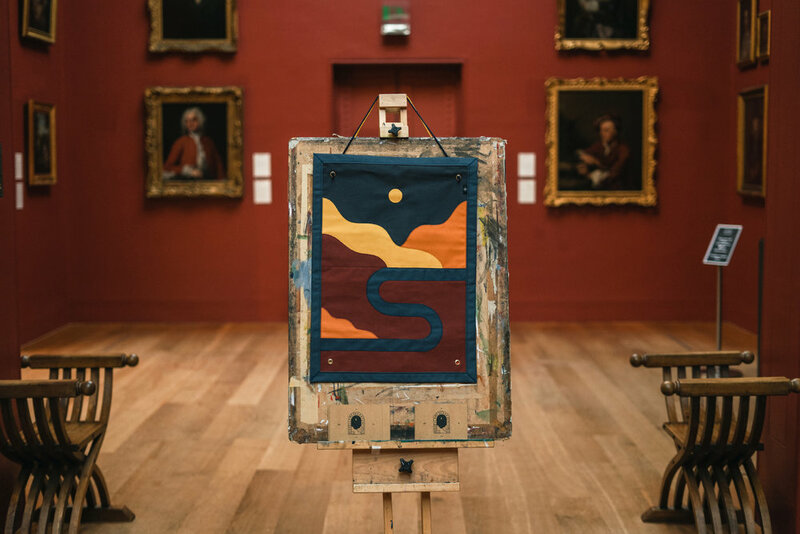 His paintings transport the viewer into the heart of the Norwegian landscape; with this is mind we designed a workshop which focused on simplfiying Sohlberg’s paintings to create mini felt pennant flags. Using wooden laser cut templates, sticky backed felt and Sohlberg’s work as inspiration, children were encouraged to create simple landscape compositions on a pre-cut flag background, finished with brass rivets and string. It was a joy to see the excitement and concentration with which each child approached the task, the variety of wonderful designs and their sense of pride in completing their very own Sohlberg flags. This was also a great opportunity for us to debut a new collection of appliqué flags we’ve been working on in the studio…more of that to come soon, but you can see a sneak peek of one in the gallery above. This was a new experience for us as we’re definitely more at home teaching in an outdoor setting but we’re glad we took on the challenge and really enjoyed the day. Many thanks to Rachel and the gallery for inviting us to take part and to all the children (and adults!) that joined in our workshop. We’ll be heading back to the gallery in June to teach a different kind of creative workshop to adults, called ‘Sustainable Art’, the details of which can be found here. We’d love see you there!